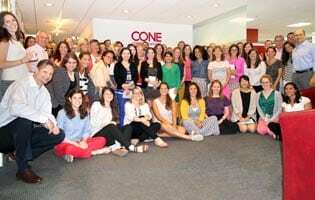 Cone Communications continues to innovate and lead the Corporate Social Responsibility discipline among agencies. This year, the agency set a new standard for CSR activities. Its new approach to CSR is called Corporate Social Return and centers on measurable business, brand and societal impacts that yield benefits for vested stakeholders. Cone believes CSR efforts must be designed and communicated so that each group of vested stakeholders will recognize and receive specific benefit. Under its Corporate Social Return philosophy, Cone crafts Corporate Social Return Campaigns by pairing its deep understanding of issues and stakeholders with laser-focus on impact measurement. These campaigns integrate a company’s business and social commitments to inspire stakeholder action and deliver mutual return. Relevant: Does it align with the company’s mission/purpose? For the last 20 years, Cone’s CSR research has served as a go-to resource for media and opinion makers alike. In the past year, Cone Communications earned nearly 268 million media impressions for its work. Its CSR experts are some of the most in-demand thought leaders in the industry. Clients who have developed successful CSR initiatives with Cone include CVS/Caremark, Green Mountain Coffee Roasters, Hilton Worldwide, ITT, Johnson & Johnson, Nestlé Waters, Northwestern Mutual, NARS, Purina, Time Warner and Yoplait.